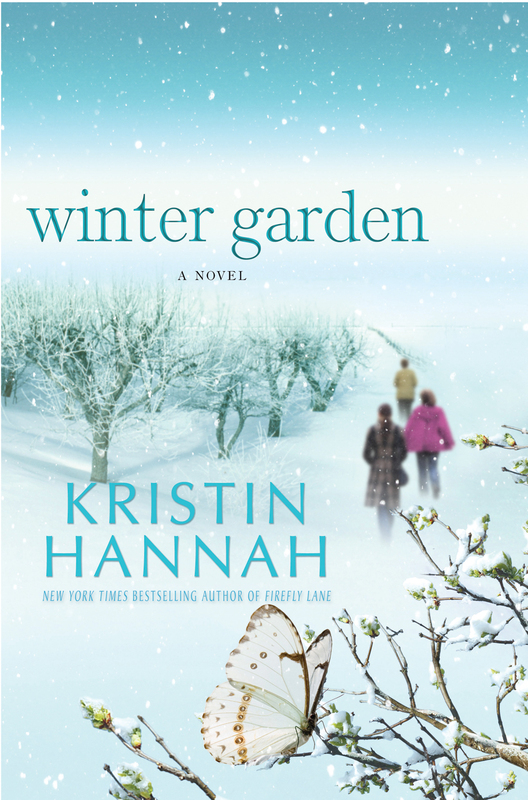 Winter Garden is another magnificent story from one of my favorite authors, NY Times best selling author, Kristin Hannah. 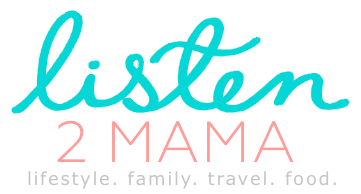 As some of you may already know I have read all of her books and have reviewed a few of them before on the blog (Firefly Lane, Night Road). I promise, here’s another one that will not disappoint. And make sure you give it a chance, as this is the type of story where you may find yourself a bit frustrated at first (I did), finding the book a little slow and maybe even disliking the characters. Don’t let that worry you, it is necessary for the story to be told this way, and as it evolves, you find yourself yearning to find out what happens, as it starts to reveal many interesting secrets from the character’s past. Truly beautifully written. From the author of acclaimed national bestseller Firefly Lane comes a haunting, heartbreakingly beautiful novel that illuminates the intricate mother-daughter bond and explores the enduring links between past and present. Meredith and Nina Whitson are as different as sisters can be. One stayed at home to raise her children and manage the family apple orchard; the other followed a dream and traveled the world to become a famous photojournalist. But when their beloved father falls ill, these two estranged women will find themselves together again, standing alongside their cold, disapproving mother, Anya, who even now, offers no comfort to her daughters. On his deathbed, their father extracts one last promise from the women in his life. It begins with a story that is unlike anything the sisters have heard before—a captivating, mysterious love story that spans sixty-five years and moves from frozen, war torn Leningrad to modern-day Alaska. The vividly imagined tale brings these three women together in a way that none could have expected. Meredith and Nina will finally learn the secret of their mother’s past and uncover a truth so terrible it will shake the foundation of their family and change who they think they are. 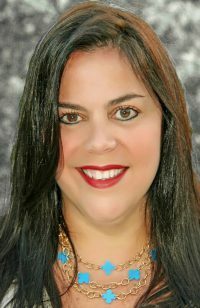 Every once in a while a writer comes along who navigates the complex and layered landscape of the human heart. For this generation, it’s Kristin Hannah. Mesmerizing from the first page to the last, Winter Garden is an evocative, lyrically-written novel that will long be remembered. So, pickup a copy of Winter Garden and grab a cup of hot chocolate, and enjoy a great read. Have you read any good books lately? 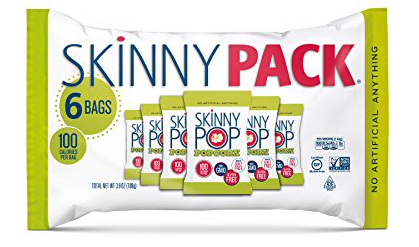 I love suggestions! 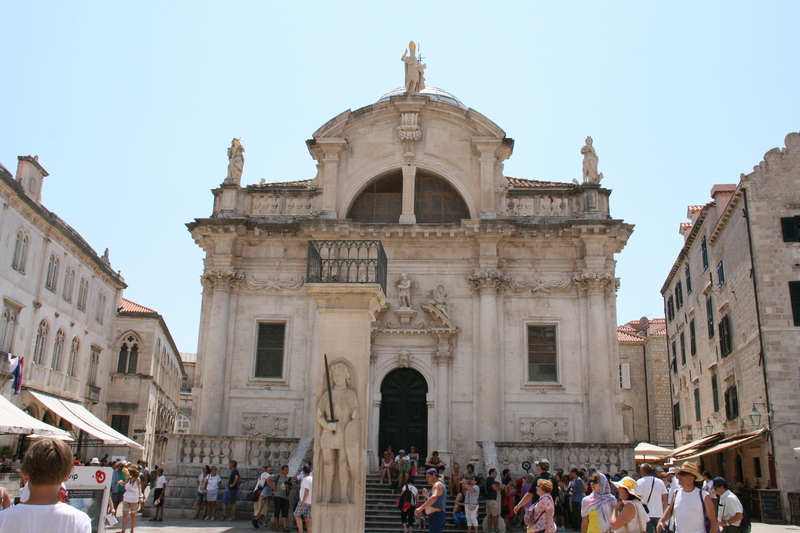 Dubrovnik, or as it is known, the “Pearl of the Adriatic” is simply breathtaking, and according to playwright George Bernard Shaw “Those who seek paradise on earth should come to Dubrovnik”. I agree with him. 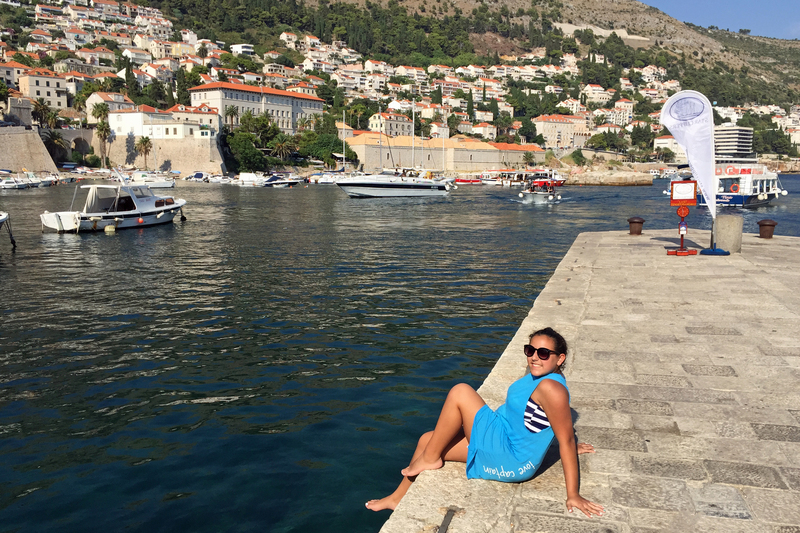 While I have had the pleasure of visiting magnificent places along Italy’s Amalfi Coast, the French Riviera, and the Greek Islands, Dubrovnik was simply a place that was still on my bucket list, and I just had to check it off. 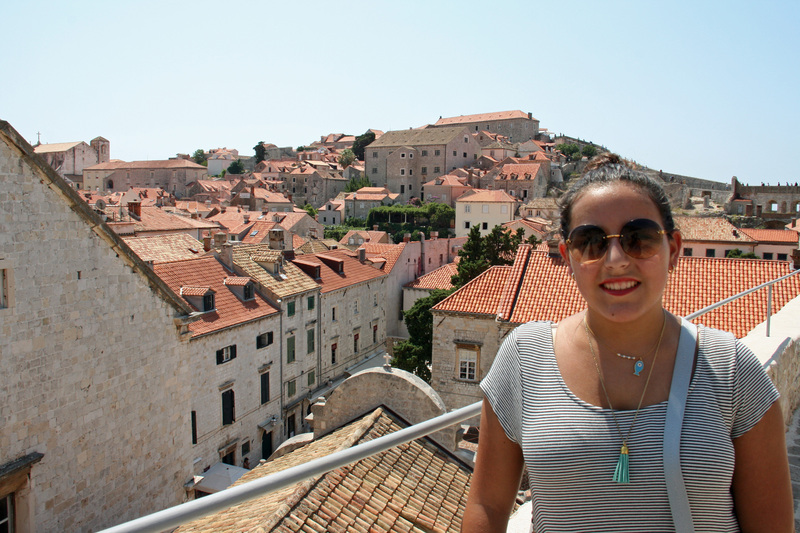 After seeing so many glorious photos of this sleepy, medieval town (a UNESCO Heritage site since 1979), I just knew a visit to Croatia was a necessity. 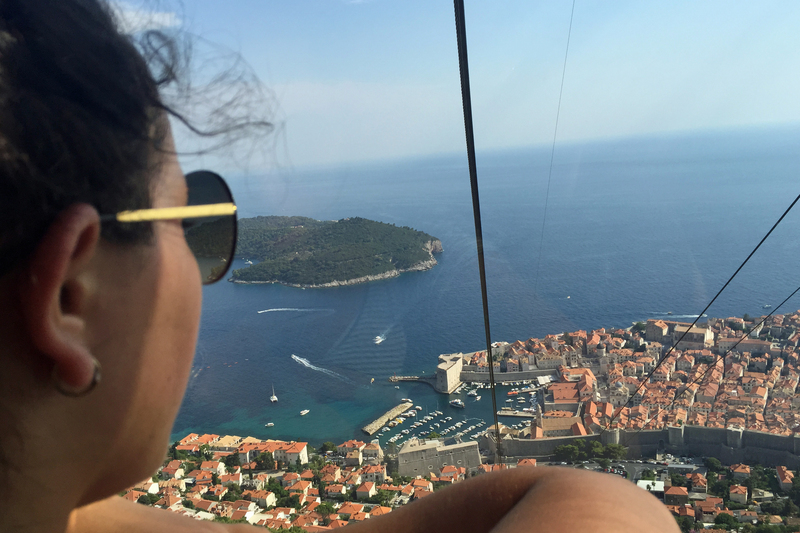 Luckily I was blessed with the opportunity of visiting Dubrovnik recently and it certainly lived up to its reputation, how could it not…beaches, cliff diving, ancient medieval town, beautiful terracotta roof tiles, great food, fantastic nightlife and add a bit of romance. And one of the things I also really enjoyed about this place was that even though we visited during the peak of the summer in August and yes, there were hundreds of tourists everywhere….I could still feel the difference, it’s not quite as spoiled as some of the other destinations like Venice or Mykonos, which was pleasantly surprising. Entering the city through Pile Gate, there’s still the feeling that not too much has changed. View out of our suite window. 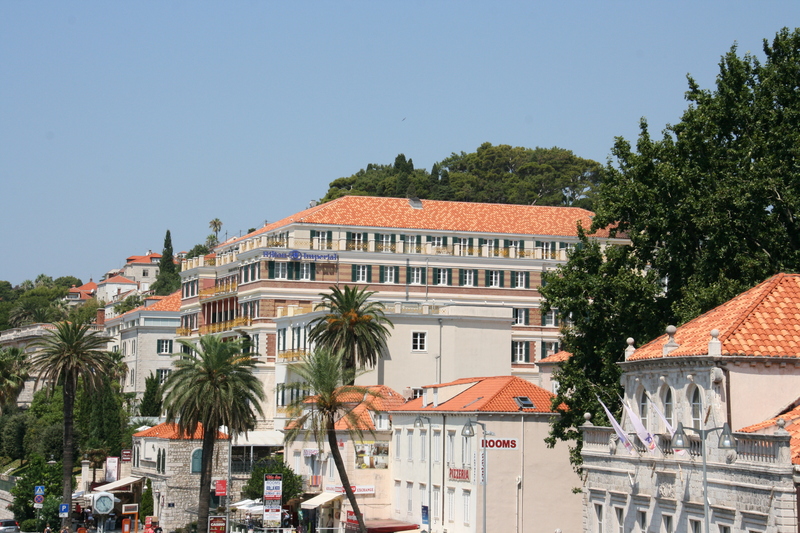 View of our hotel from the city walls (that’s how close we were). 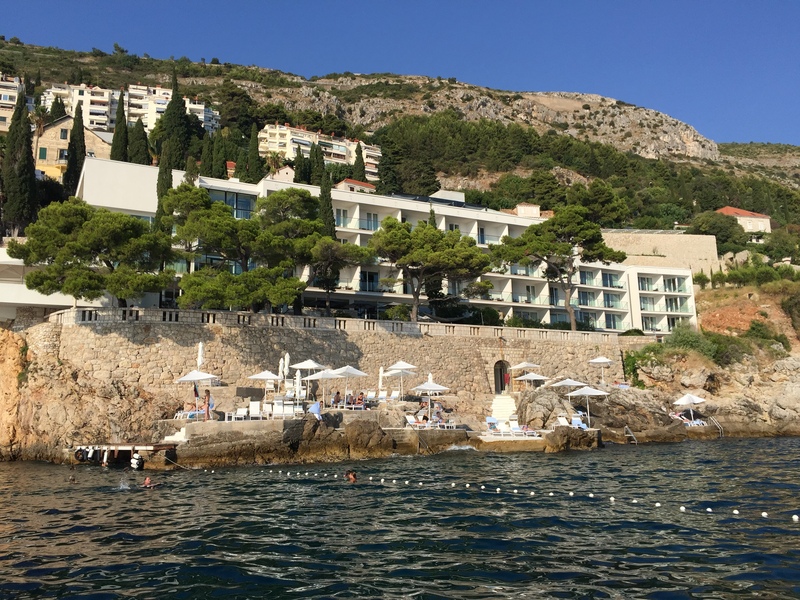 In addition to the views, the hotel offered a delicious buffet breakfast and a number of different amenities, along with a fantastic location just a few steps away from the historic entrance at Pile Gate. 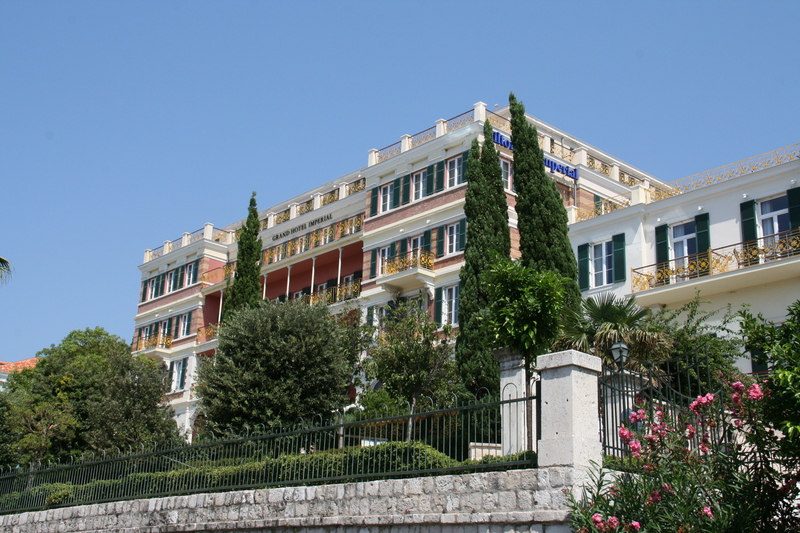 There are also plenty of buses and taxis available right outside the hotel, making it easy to get round town and to the nearby beaches. 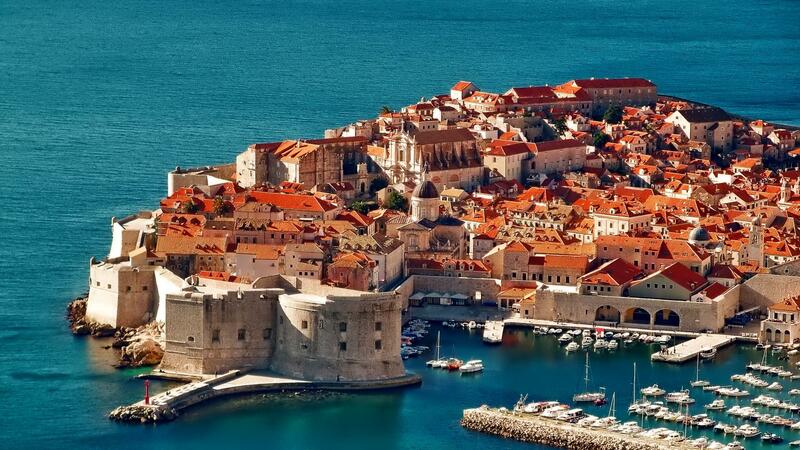 Dubrovnik’s picturesque city wall surrounds this gorgeous city perched above the Adriatic Sea. Tourists flock here to parade down the old town’s shiny streets, which again, in the height of the summer, can get quite crowded. But in my opinion, walking the city walls, cannot be missed. 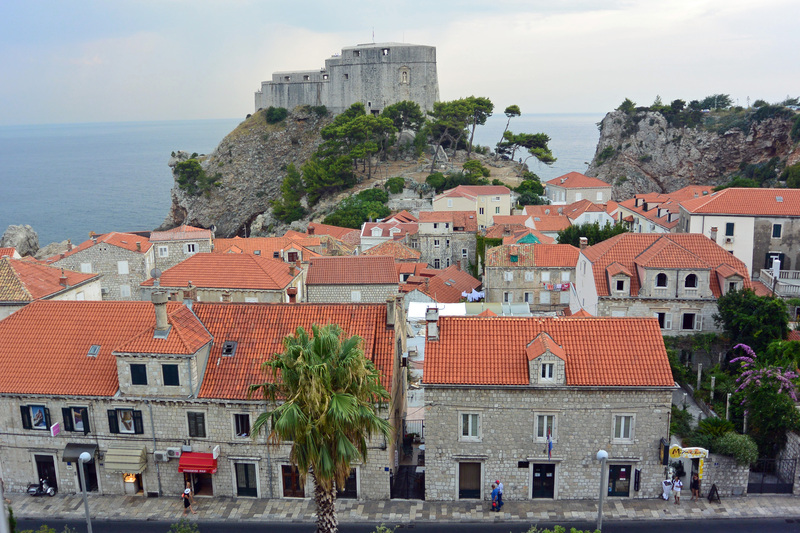 While walking the full perimeter atop the old city walls, (and no, you don’t have to walk the entire perimeter), you will be rewarded with the most amazing views. 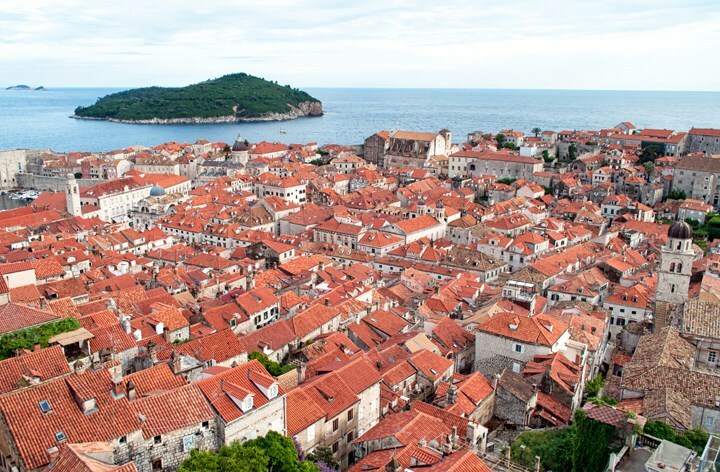 Perched up above all the orange rooftops and church spires, you can circle the city and gaze down on it while you take in the ocean and surrounding islands. 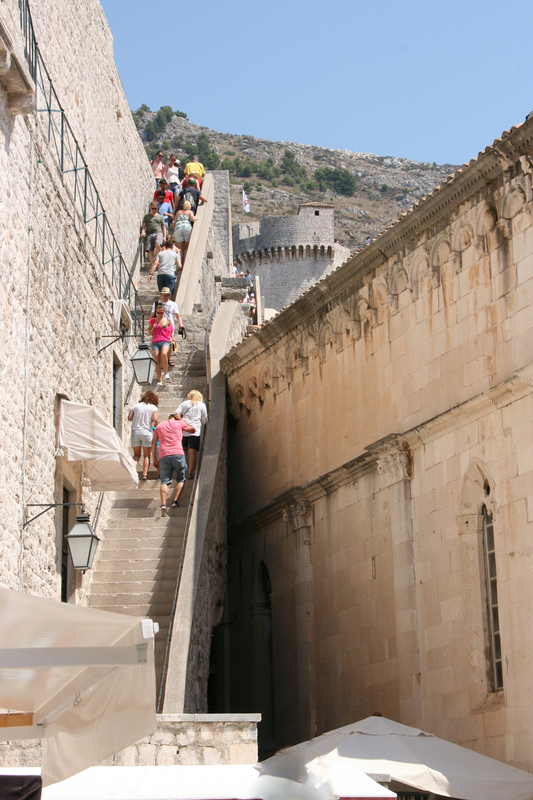 The steep stairs you must climb to go up to the city walls. 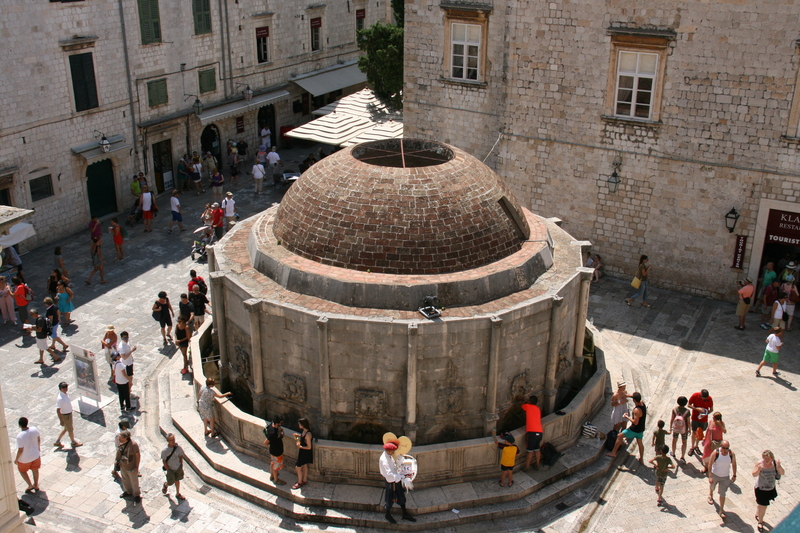 Onofrio Fountain, one of Dubrovnik’s most famous landmarks. 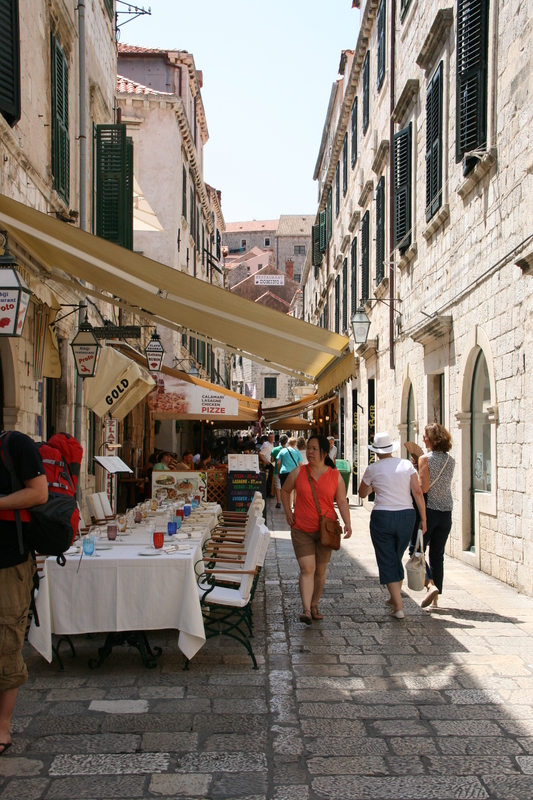 Crowds of tourists walking through the main street of the old city. The views from the walls. 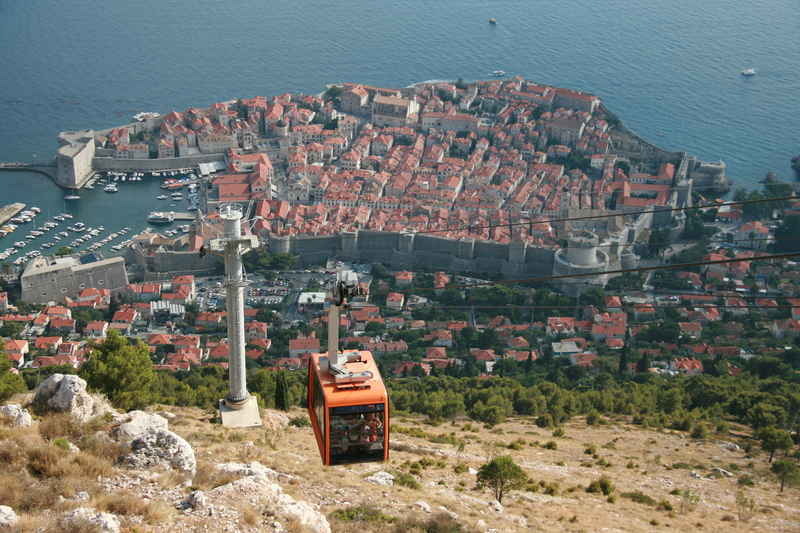 For a fantastic panoramic view of this walled city, take the funicular up Mount Srd to the Napoleonic Fort Imperial, which overlooks the entire city. 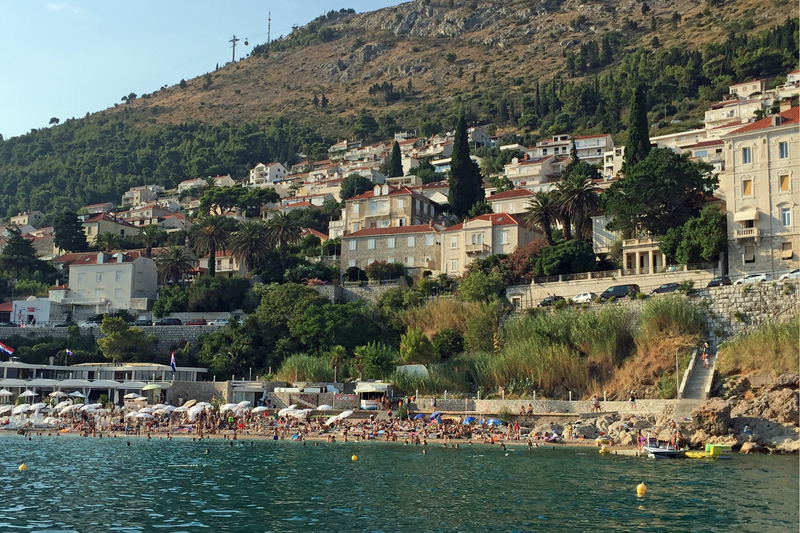 Scrub surfaced Mount Srd, stands 400 meters above Dubrovnik. 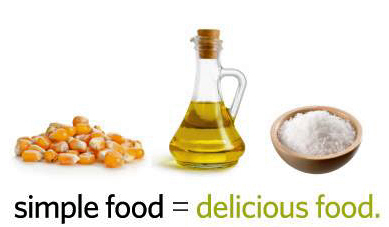 It can be also be reached by car (15 minutes) or on foot (90 minutes walk). If you decide to visit the mountain, you’ll be able to enjoy some of the best views over the city. 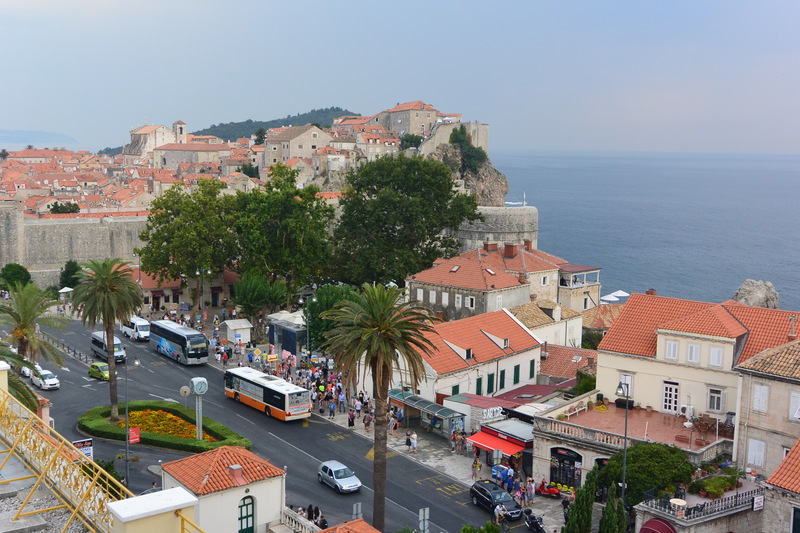 The views of the old town are amazing! Our daughter enjoying the views on the way back down. 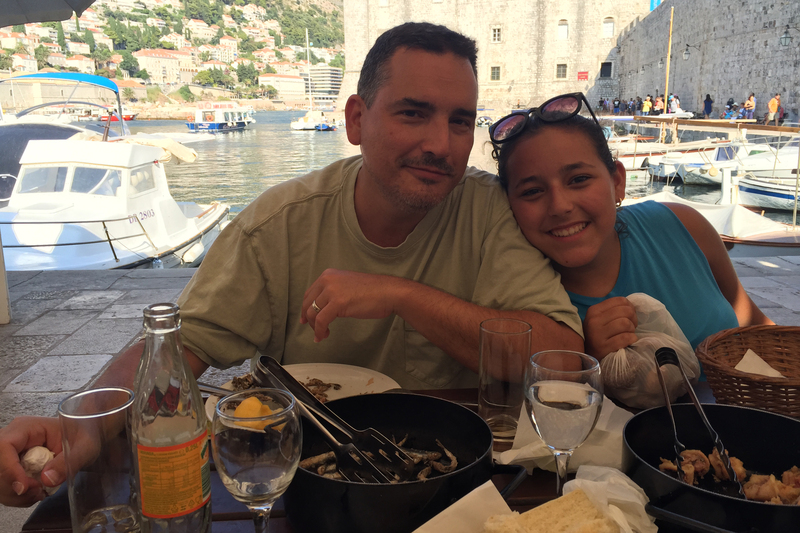 As with most popular European cities, Dubrovnik has its fair share of traditional tacky tourist shops, as my husband likes to call them, along the main drag but don’t be discouraged. 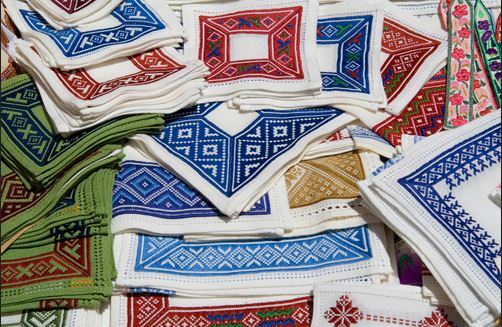 You can also find some places selling beautiful embroidered tablecloths and linen, Dalmatian wines, spirits (known as rajika), and delicious preserves and dried fruit, all beautifully packaged. 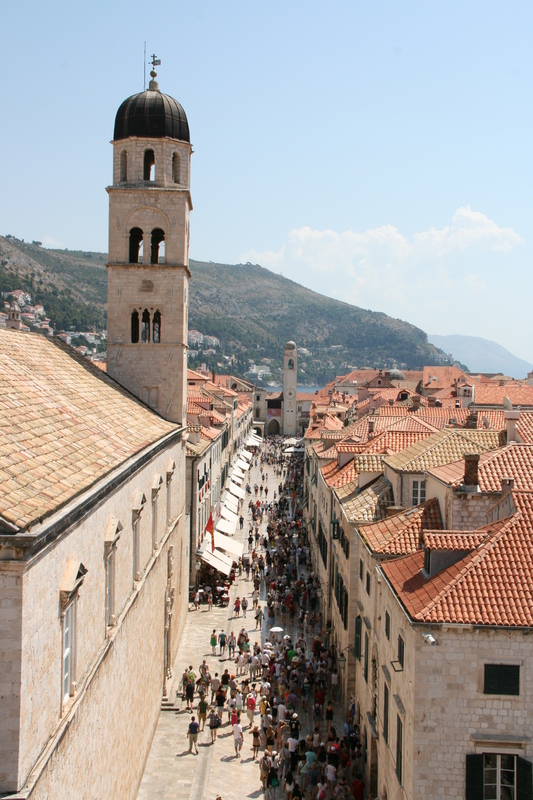 Oh and the old city is a pedestrian zone, so you don’t have to worry about traffic as you wander through the marble-paved streets. 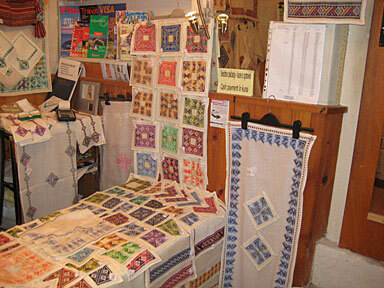 Some of the beautiful linens sold in some shops, all embroidered by hand. 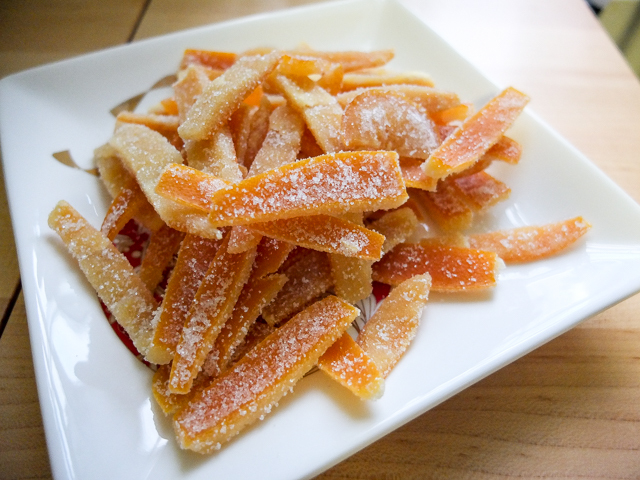 Sugar coated lemon and orange peels are sold in certain shops, and packaged in cute souvenir bags. 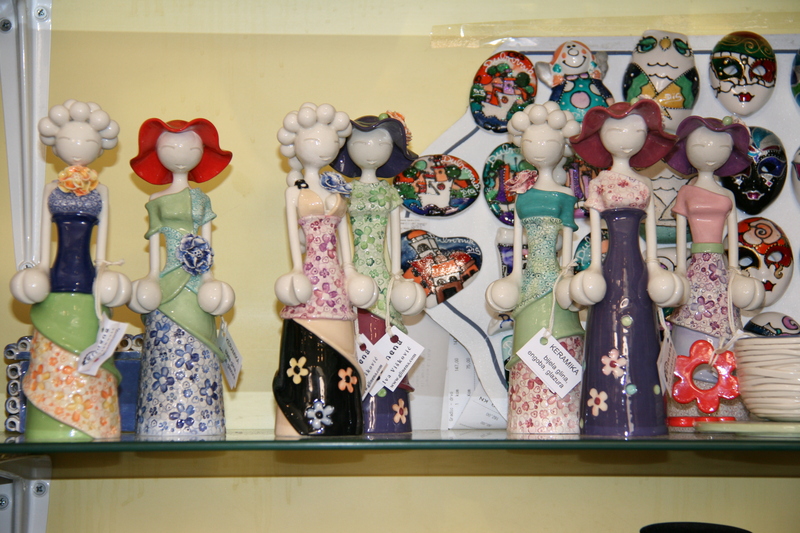 My daughter loved these pretty ceramic figurines. And of course in the 100 degree weather we were experiencing, a long day at the beach accompanied by a sunset cruise, is a must. 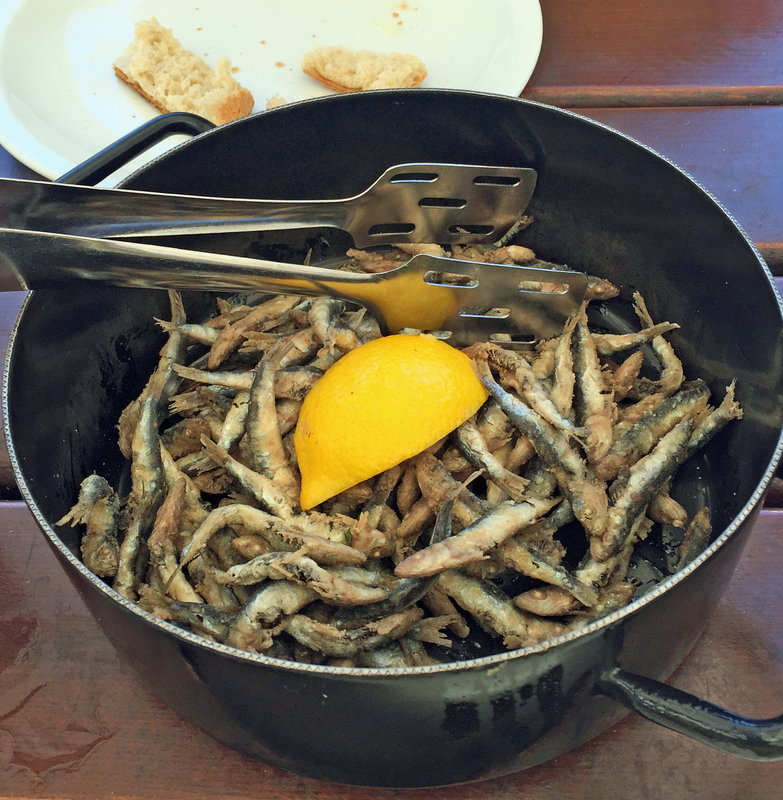 We chose to visit Banje Beach, because of its location, with beautiful views of the walls of the old town and Lokrum Island which is nearby. 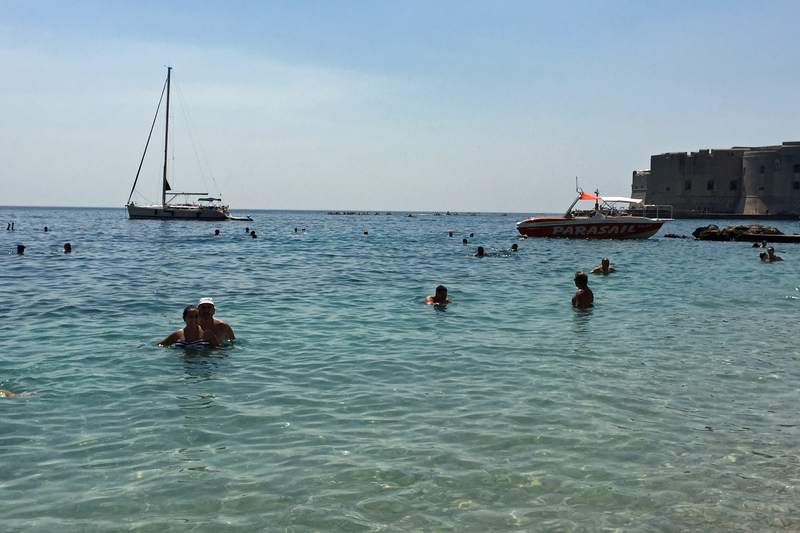 I will say, as much as I enjoyed the beach with the crystal clear, cool water, I wish I would have brought some water shoes, as the beaches here are full of large stones and pebbles and by the time we left our feet were hurting quite a bit. 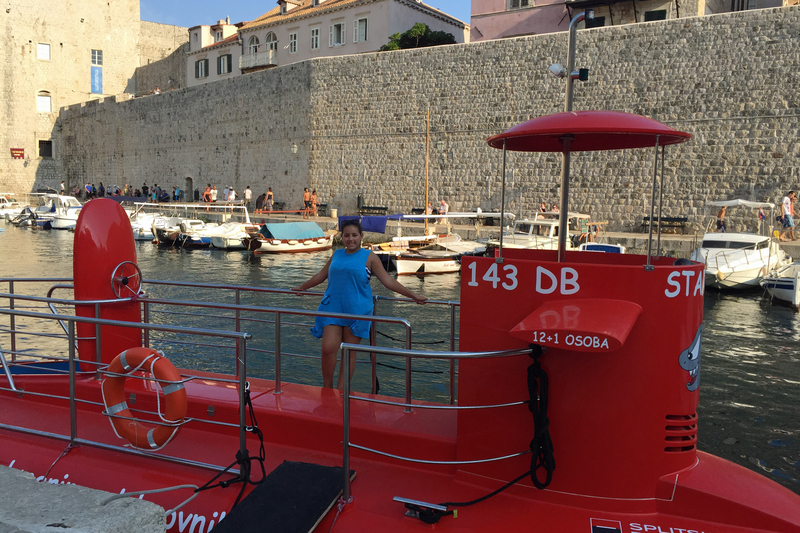 There is a 2-hour sunset cruise along the Dubrovnik coast where you’ll need your camera to capture the most glorious sunsets while in your own private boat. 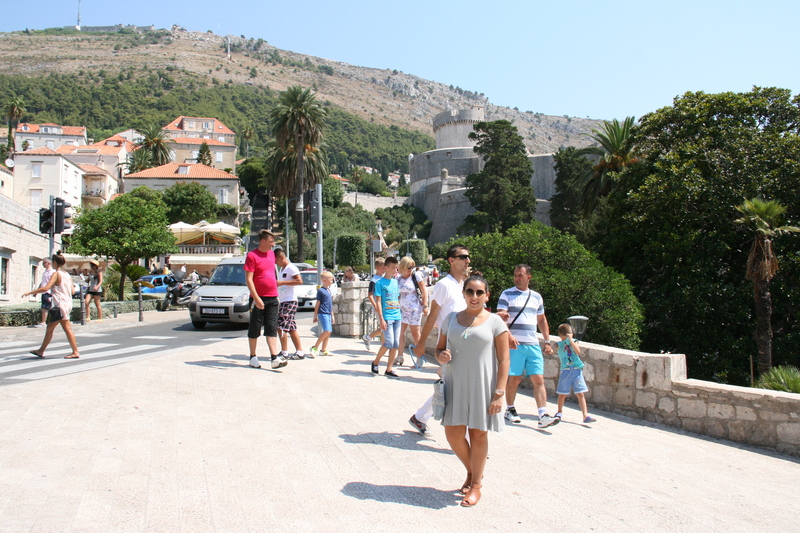 See the city walls from the sea as well as various reefs, the lighthouse and Lokrum Island. In addition to this cruise, there are many other boat excursions leaving from the harbor, also offering terrific views of the coast. 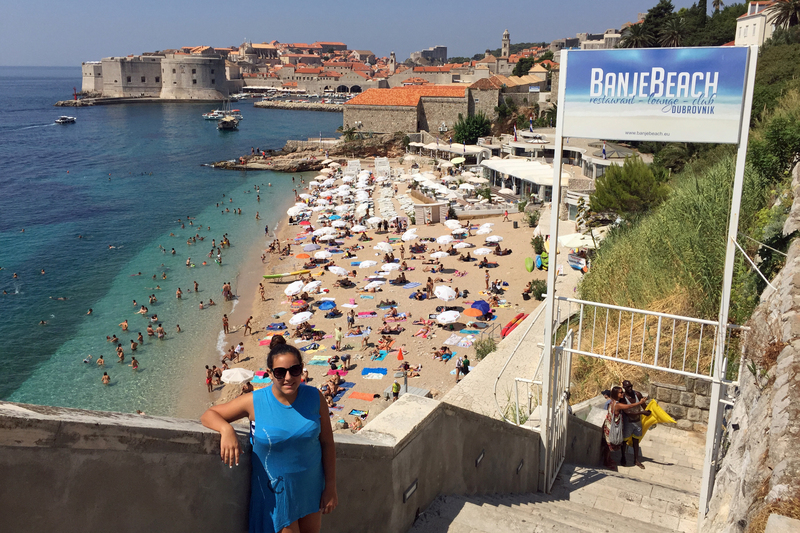 Famous Banje Beach with views of the old town in the background. View of Banje Beach from the sub. 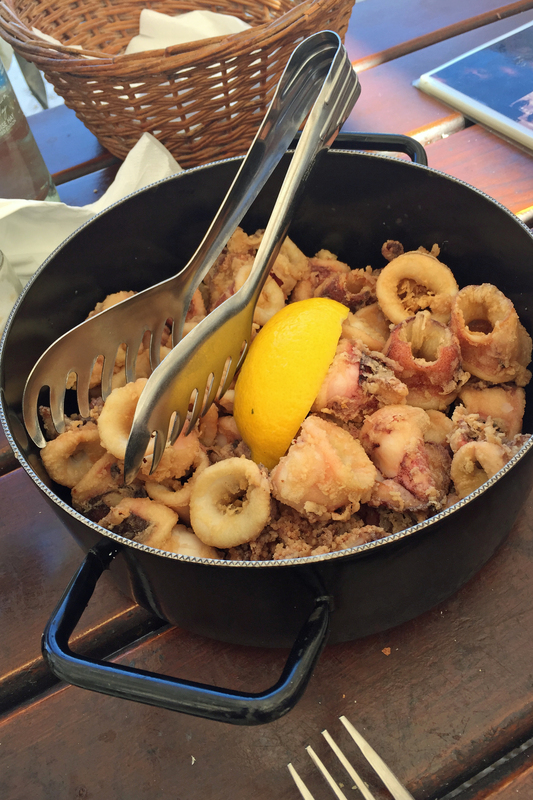 Ready for a late lunch! 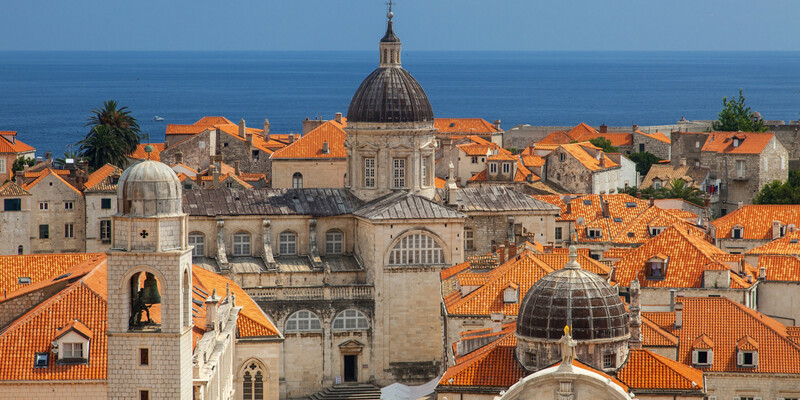 And last but not least Dubrovnik is home to several locations used in filming the hit TV show Game of Thrones, which I know nothing about (gasp). 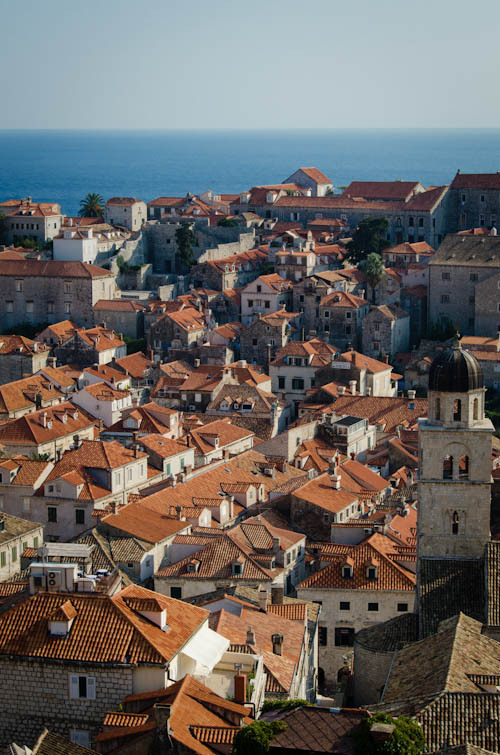 Take a three-hour tour around the Dubrovnik old town to see where most of the filming took place. 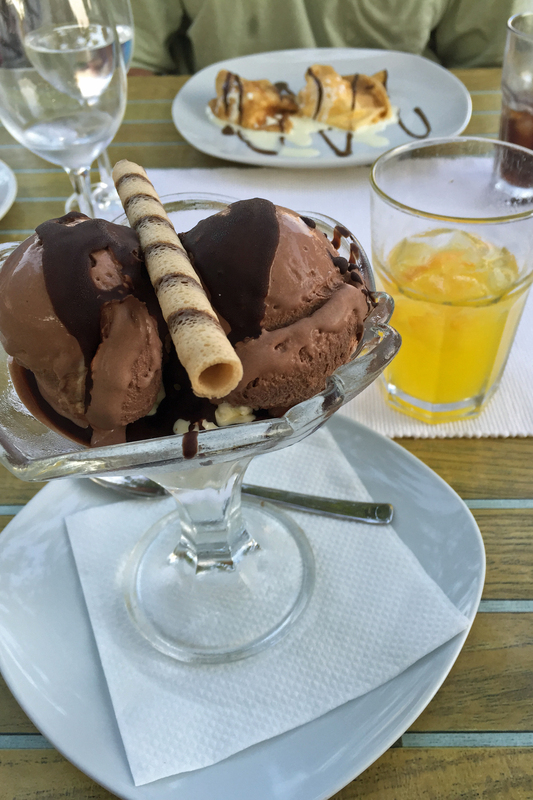 Upgrading your tour will include an extra one and a half hour trip to Trsteno Arboretum. 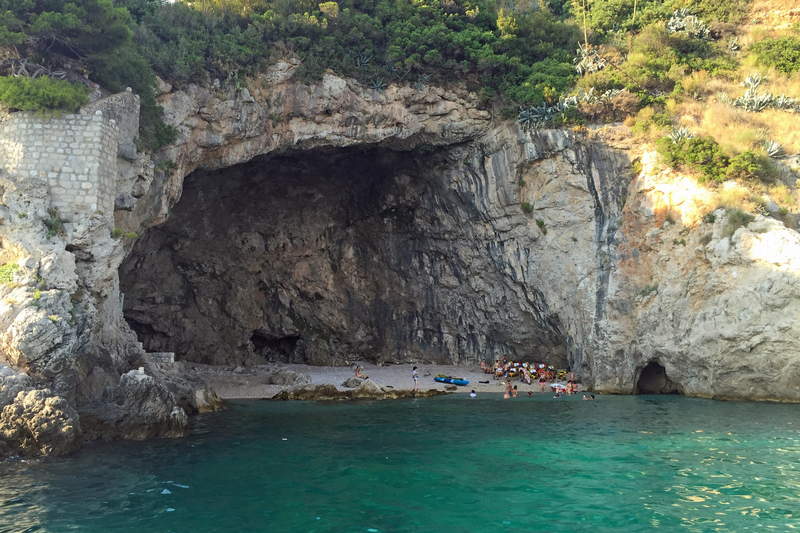 Here are a few more photos of our trip for your enjoyment. 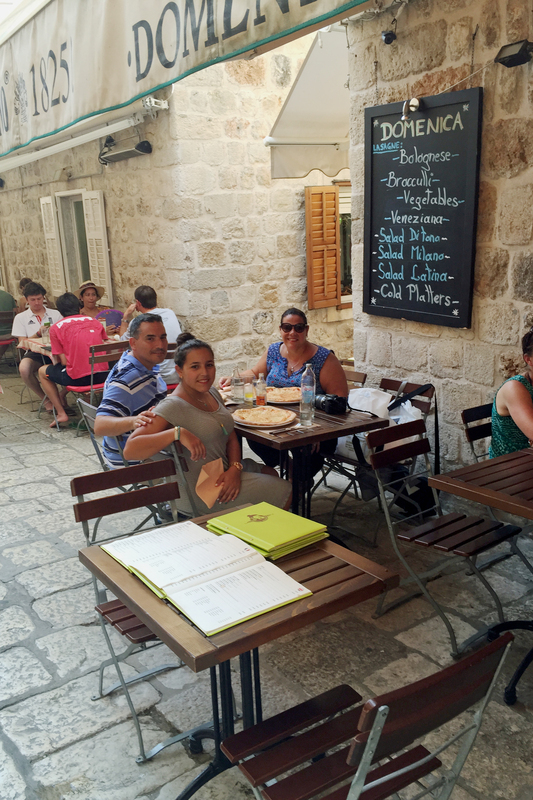 One of the many side street cafes. 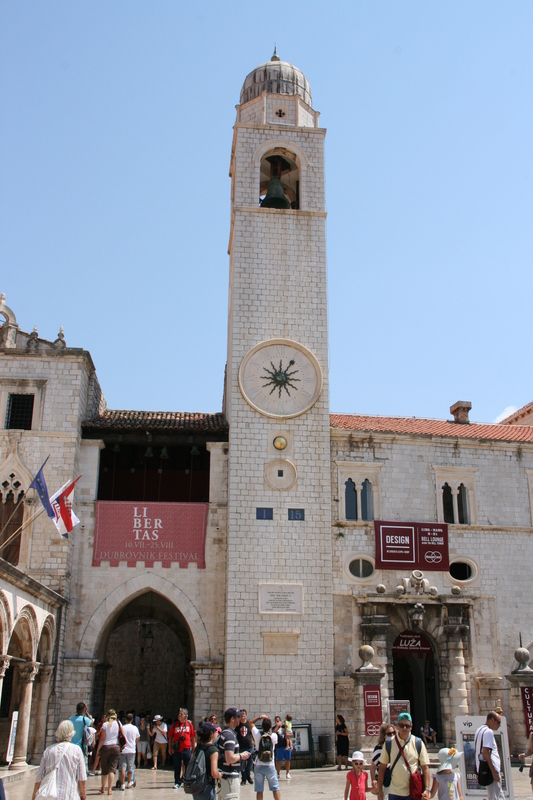 St. Blaise with its monumental stairway at center, and the Gothic column of Roland right in front. 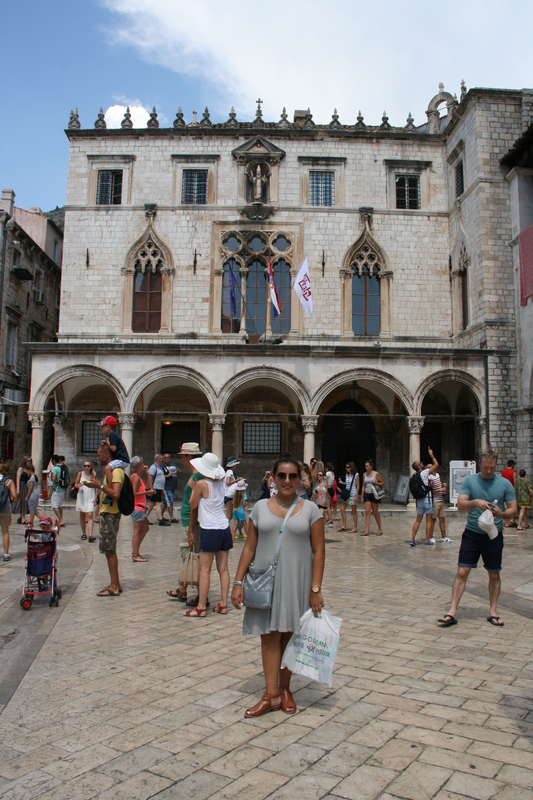 The beautiful Venetian looking Sponza Palace. Having some of the best pizza at Domenica Pizzeria…yum! 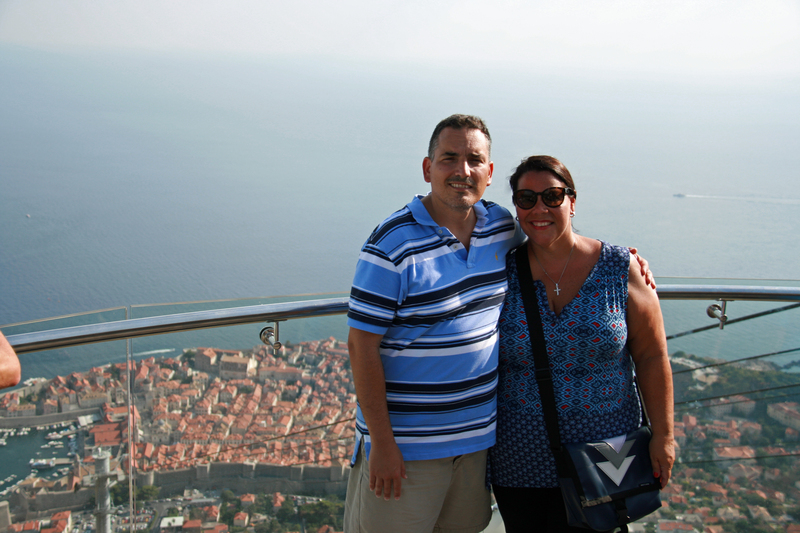 Enjoying some crepes and gelato at Dubrovka Cafe, which also offers amazing views.